Imagine conservation as a three-legged stool. You need the wildlife, you need local people to be committed to conservation… and you need people to hunt down rare animals and kill them. “When one of those legs isn’t there, the whole thing falls apart,” says Joe Hosmer, vice-president of Safari Club International. Yes, the way to save wild animals, hunting advocates say, is to hunt them . Done properly, trophy hunting can provide a source of jobs and income, and thus give local communities a reason to protect wildlife and habitats that might otherwise be sacrificed to rural villagers’ need to put meat on the table. Countries that can attract jeep loads of camera-toting tourists can get along without trophy hunting: Kenya does not need it, for example. Driving conservation efforts outside of protected areas, where an animal has no, or limited, economic value, is extremely difficult. For most conservation programmes to succeed, there is a need for economic incentives. National economies as well as local communities can benefit from the income generated from trophy hunting as a form of land use. 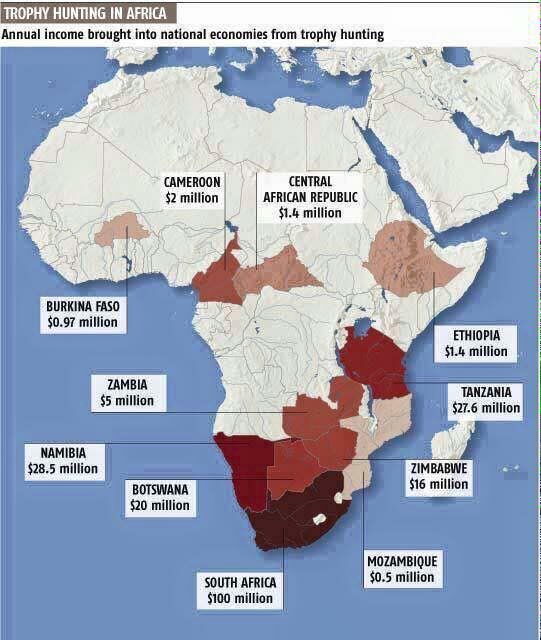 In Africa approximately $200 million (U.S.) per year, across 23 countries, is paid by tourists to trophy hunt. 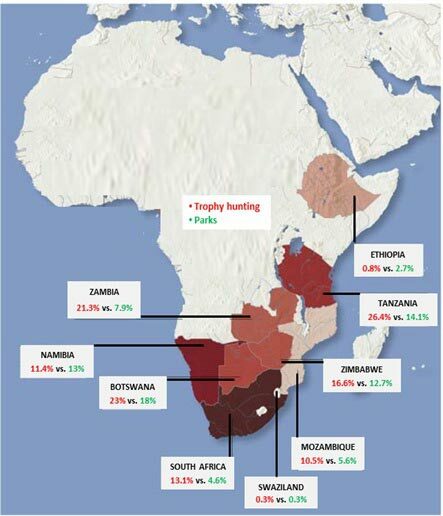 Trophy hunting safaris also have the potential to be less invasive than ecotourism as more revenue can be generated from less people, as hunter fees generally outweigh the average ecotourism fees. This may result in reduced environmental impact as fewer people enter the parks and disturb the wildlife and habitat. Sustainable trophy hunting, along with strict national conservation measures, has assisted in the recovery of southern white rhino in South Africa and Swaziland from >100 to over 20, 000 individuals today. In 1994 the South African white rhino population was down-listed from the Convention on International Trade in Endangered Species (CITES) Appendices I to II, which allowed for trophy hunting and live sales. This provided a financial incentive for private landowners to reintroduce the rhino onto their land where populations then recovered. The Namibian government auctions off five black rhino hunting permits (or tags) per year for conservation funding, as permitted under CITES. Black rhino populations are heavily monitored and only older male black rhinos that are no longer contributing to the gene pool are allowed to be hunted. Ageing and increasingly aggressive surplus black rhinoceros males have also become a problem for biological management. The sale of these trophy hunting permits are not only endorsed by CITES but also the International Union of the Conservation of Nature, World Wildlife Fund, U.S. Fish and Wildlife Services. Active persecution, habitat loss/modification, competition with livestock or overutilization are considered to be the leading causes that are driving African animals towards extinction. The costs to try mitigate these negative effects are extortionate. Sustainable trophy hunting can be part of the solution to preventing African wildlife extinctions. By offering economic incentives for governments, local communities and individual land owners, trophy hunting becomes economically sustainable and encourages conservation efforts. Conservation programmes can also be directly funded from the revenue generated through hunting ventures. When carefully managed, trophy hunting can be a valid tool used to aid conservation and help save African wildlife. Sourced from 3Rs in Ecology, Reed Business Information and New Science.